We champion, build and strengthen relationships between brothers and sisters, aged 7 -18 years, separated by the care system. We use creative activities and skilled adult support to help the young people we work with in rebuilding their sibling relationships, supporting their broader social welfare and emotional well-being. Our role is to provide the guidance, structure, consistency and opportunities that children and young people should receive within a family but often lose when in care. We also partner with other organisations to influence the policy and practice of those working with looked-after children to encourage a focus on sibling contact. We are committed to working to address the needs of the four out of every five children in care living apart from at least one brother or sister. 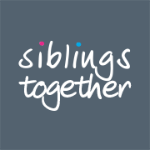 Siblings Together became a charity in August 2010 having previously been established as a not for profit limited company in March 2009. Our founder and CEO, Delma Hughes, had worked since 2008 developing the vision and models underlying our work. She is informed by more than 20 years of professional experience as an Art Therapist working with looked after children as well as by personal experience of separation from siblings in the care system.